Easter is coming in a couple of months. What little girl wouldn't want this cute little Ballerina Bunny in her Easter basket? Ballerina Bunny (or 'Long Ears' as my daughter named hers) is approximately 9 inches long, made out of 100% cotton, and is machine washable. 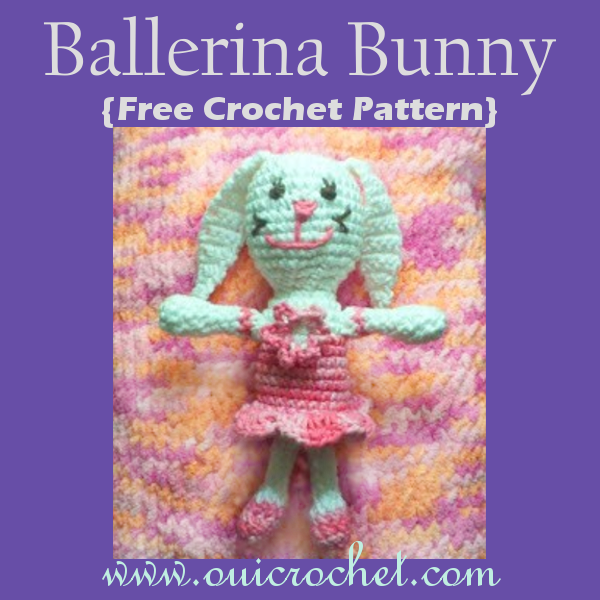 This Ballerina Bunny is not hard to make. I included a couple of notes in the pattern that indicate the best times to embroider the little bunny face, and to stuff the bunny. Once I put the bunny together, I thought that the legs looked a bit on the short side. I also indicated, in the pattern, where you can add a round or two to make the legs a bit longer. Yarn of your choice - Worsted weight. I used cotton yarn. Note: You will be working in a round, so it will be necessary to mark the first stitch of each round with a stitch marker. With color A, Ch 4, join with sl st to first ch to form a ring. Round 28: Working through both loops of the previous row, sl st to the next sc, ch 3, 4 dc in the same stitch, ch 1, skip the next stitch, sc in the next stitch, ch 1, skip the next stitch, *work 5 dc in next st, ch 1, skip the next stitch, sc in the next stitch, ch 1, skip the next st* repeat from *to* around. Join with sl st to the top of first ch 3. Finish off. Switch back to color A. Reattach it to the marked back loop of round 27. Do not finish off. Stuff the body, now. Finish off leaving a long tail. Weave the tail through and pull tight to close off and knot. Weave in all loose ends. Do not finish off. Stuff the paw now. Switch back to color A.
sl st to next sc. Finish off. Do not finish off. Stuff the foot now. Row 17: Ch 1, sc. Finish off and weave in ends. Ch 2, sc 6 in second ch from hook. Join with sl st.
[ch 5, sl st in next sc] around. Finish off. On Tuesday, I shared my pattern for Child's Simple Slippers. Today, I am going to show you how to customize that pattern to fit virtually any foot size. All it takes is a little measuring and a couple of very simple calculations. If you look back at Tuesday's post: Child's Simple Slippers, you will see an example of how I used my daughter's foot measurements to make her slippers. I will start with the pattern, so that you can get a basic overview of what we are doing here. Below the pattern, I explain how you calculate the size you need. It is really easy. I promise! Make your starting chain as long as your calculated toe length, +2 ch. For the first row, you will begin with a hdc stitch in the 3rd ch from hook. If you are making child - adult sized slippers, you will hdc in each ch up until the last 5. You will sc in those last 5 sts. I you are making the slippers for a baby or small toddler, you will sc in the last 3 stitches. The purpose of the sc is to make the toe more narrow, and easier to cinch closed later on. For the next rows of the toe portion, you will be working your stitches in the back loop only. So, Row 2: ch 1, sc in the bl of each of the sc sts, hdc in the bl of each of the hdc sts. Turn. Row 3: ch 2, hdc in bl of each of the hdc sts, sc in the bl of each of the sc sts. Turn. Repeat rows 2 and 3 until you reach your calculated toe width, ending with a hdc stitch. It is ok if your measurement is just a small fraction off, as long as you are very close, and you end with the hdc stitch. Now you will be starting the foot portion of the slipper. Foundation Row: You will start by working along the hdc edge of the toe portion. Hdc evenly across. You should get 3 hdc sts for every 2 rows of hdc. So, to determine how many stitches you need to work evenly across, count the rows of the toe portion. Divide that number by 2. Now multiply by 3. Row 2: ch 2, and hdc in the bl of each st across. Repeat row 2 until you reach the length of your calculated foot length. You will begin your measurement at that foundation row that meets the toe portion, and end with the last row made. Thread your yarn needle with the tail end. Fold your slipper in half, matching up the stitches. Sew up the heel of the slipper. FO and weave in ends. Thread another length of yarn (2 feet should be plenty), insert the needle through corner of the end of the toe. Leave a few inches of yarn, and being careful not to pull it all the way through, weave the yarn through the toe end. Holding the tail side of the yarn, and the needle side, pull tight to cinch the toe closed. Knot tightly, but do not finish off. Now, line up the rows of the top of the foot, and sew the top of the foot portion. Finish off and weave in ends. Attach a complimenting yarn to the top of the heel of the slipper. sc evenly around the opening. FO and weave in ends. Trace the foot that you want the slipper to fit. Note where the ball of the foot is, and section off the foot as in the picture. Measure the toe length. This is the first measurement you will use, to determine how many chain stitches you will begin with. Now, calculate your toe width. Measure the width, double it (multiply by 2), and add 1 inch. This is your toe width. This will determine the length of the toe portion of the slipper. Do not add 1 inch for infant and small toddler slippers. Measure the foot length. Now, this isn't the entire length of the foot. Just measure from the heel to right below the ball of the foot, where the toe portion begins. This will determine how long you make the foot portion of the slipper. Don't forget to write these measurements down, and write down how many stitches and rows you needed to get your proper measurements. It will really come in handy when you are making the second slipper. 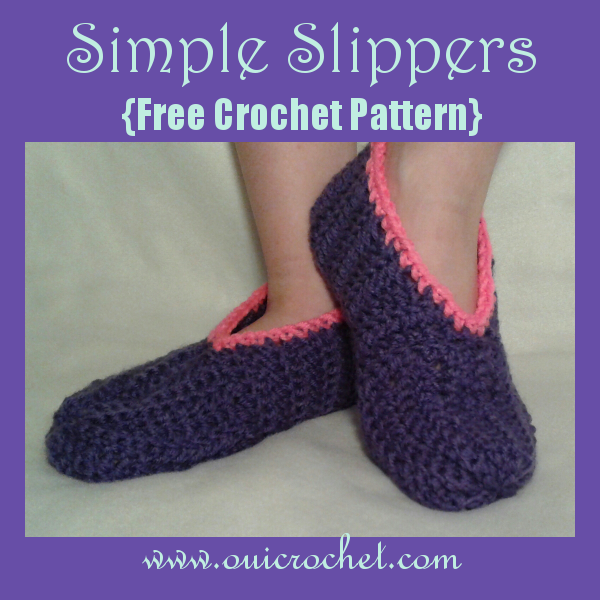 Come join Oui Crochet's Slipper Party! What is a slipper party? Well, I kind of just made it up! Check out my pattern for All Size Simple Slippers. Get creative! Choose some awesome colors, cute accessories, or adorable appliques, and customize these slippers any way you want. Share photos of your awesome slippers creation on my Facebook Page! Use the hashtag #OuiCrochetSlipperParty so that we can all check out what everyone has come up with. 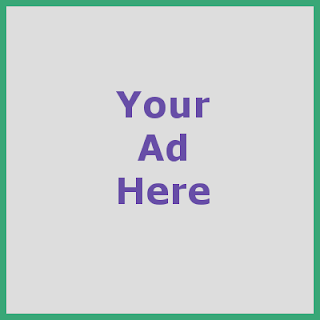 Invite your friends to join in the fun! The more the merrier! Right now! It will be going on for the next couple of weeks. If you are still working on them over the weekend, you can share them (and any other works in progress) on my Facebook Page for WIP weekend. I made this tutu dress for my now 4 year old, when she was turning 2. The dress is forgiving in size, as it stretches a bit. She was able to wear it for well over a year. 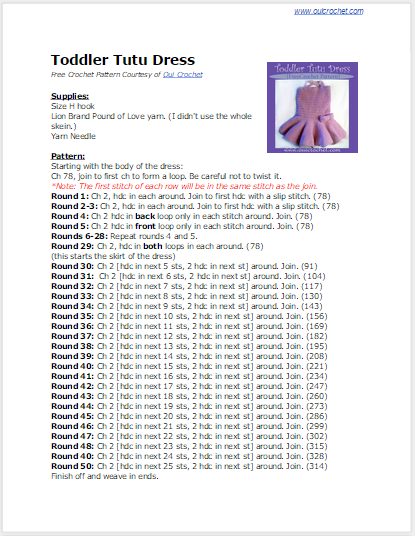 The dress is worked in rounds, beginning with the top of the body, working downward. Increases are made to the skirt to give it a full and ruffled effect. I added a little bow to embellish the dress. You can add one too, or customize it to your liking. A flower would look very pretty, too. 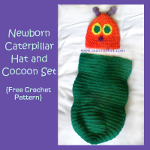 A couple of other crocheters have shared their customizations with me when I had this posted on my old site. One did a really cute red, white, and blue stars and stripes theme for Independence Day, and another used blue and yellow yarn to turned it into a Snow White dress. I am very impressed with their creativity! If you make this dress, either as is or your own spin on it, I'd love to see! Please share a photo on my Facebook page. Ch 78, join to first ch to form a loop. Be careful not to twist it. 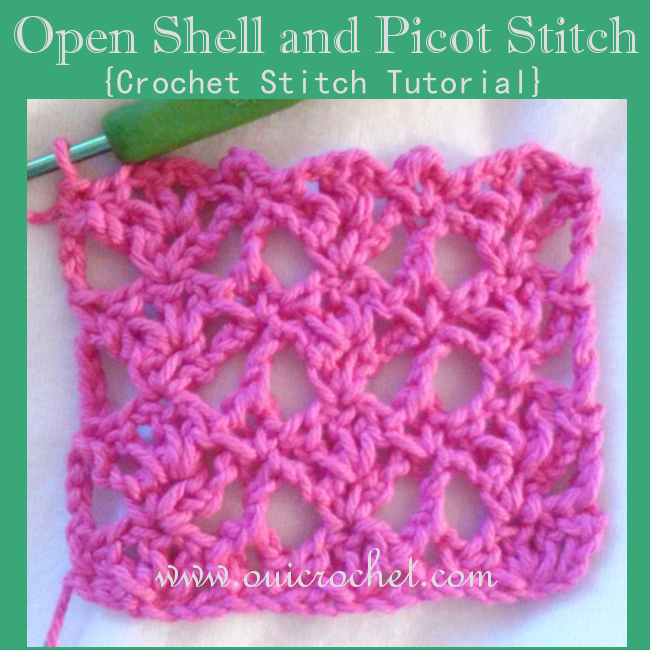 *Note: The first stitch of each row will be in the same stitch as the join. Rounds 6-28: Repeat rounds 4 and 5. Attach to the back, criss-crossing, to the 10th stitch from the left of the "seam". Slip stitch 3. Repeat with other strap, counting 29 sts to the left of the "seam" to join. Then attach the finished strap to the 13th stitch from the right of the"seam". Using yarn and a yarn needle, stitch over where the straps meet the body, to reinforce. If desired, you can add a bow or flower to the dress. I enjoy making slippers for my family. With 7 kids, sometimes simpler is better! Today, I will share my pattern for the simple slippers that I made for our 7 year old. Unfortunately, one size does not fit all. That is ok, though. 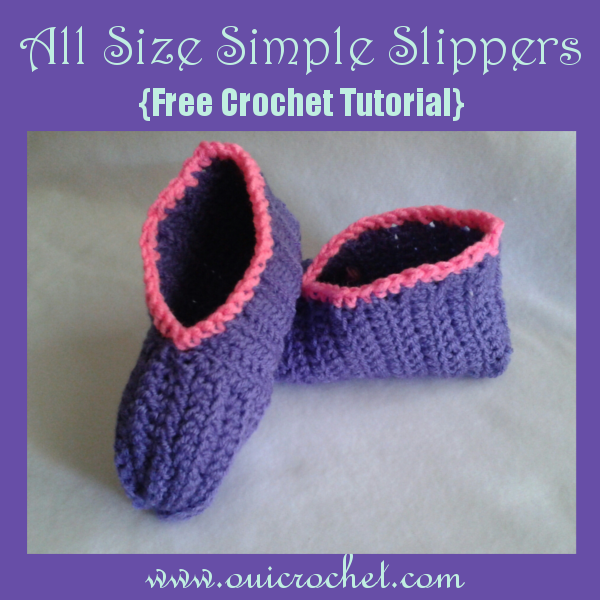 On Thursday, I will be sharing a tutorial that will show you how to easily customize the size of these simple slippers, to fit virtually any foot size. While these slippers are pretty darn cute as they are, you can easily customize them by adding cute little flowers or appliques. Of course, you can use whichever color combination you please. Have fun with them! Be creative! I would love to see what you come up with. As always, feel free to share pics of anything you make from any of my patterns on my Facebook Page. 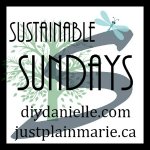 Swing by on weekends too, and share your work in progress of anything you are working on. I look forward to seeing you there! 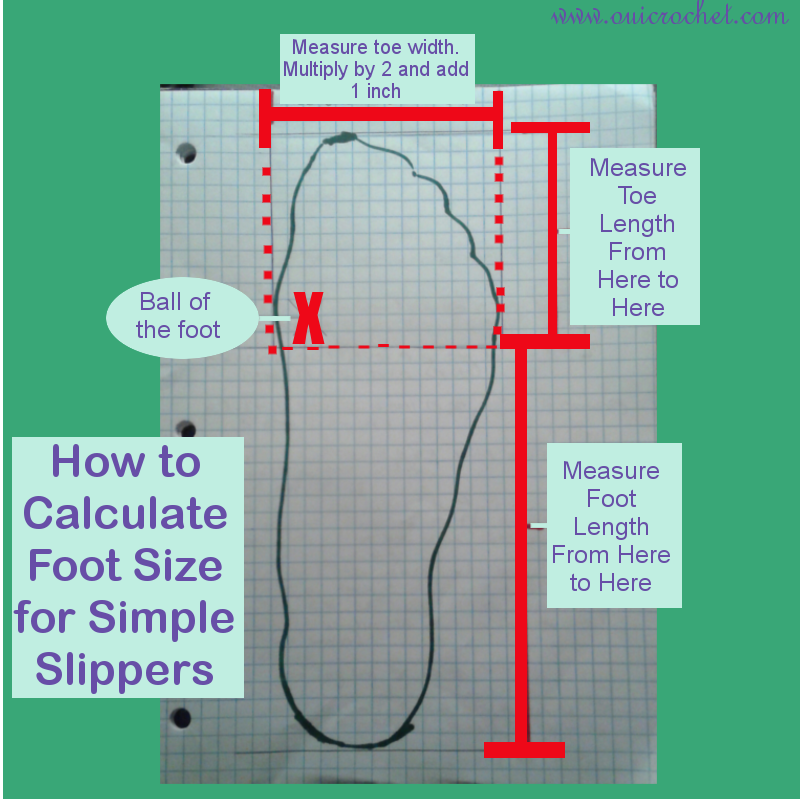 If you go over and take a peek at Thursday's post: All Size Simple Slippers, you will see where I get the calculated measurements for my daughter's foot. Her foot is 7 1/2 inches long. The calculated toe length is 3 the inches, the calculated toe width is 7 inches, and the calculated foot length is 4 1/2 inches. 11 chains measures out to 3 inches, so I add 2 chains to that. Rows 4-18: repeat rows 2 & 3. You should end with a hdc stitch, so do not finish off. Thread another length of yarn, insert the needle through corner of the end of the toe. Leave a few inches of yarn, and being careful not to pull it all the way through, weave the yarn through the toe end. Holding the tail side of the yarn, and the needle side, pull tight to cinch the toe closed. Knot tightly, but do not finish off. 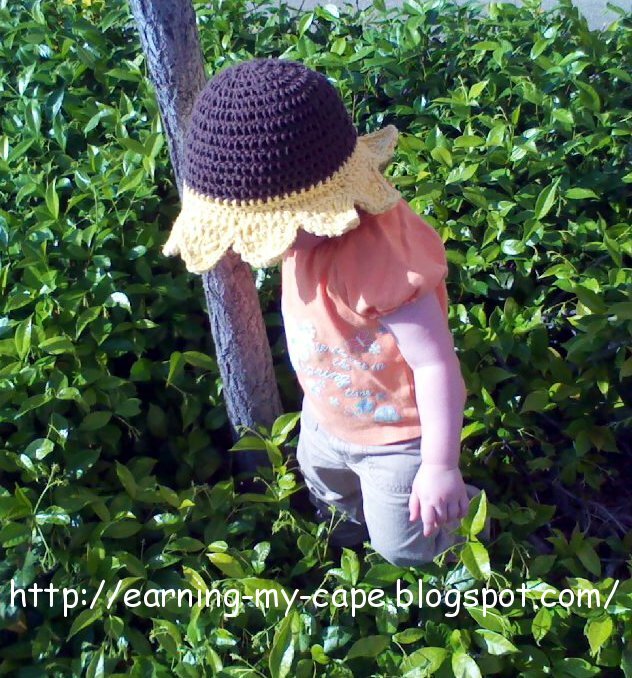 Do you crochet for little girls? 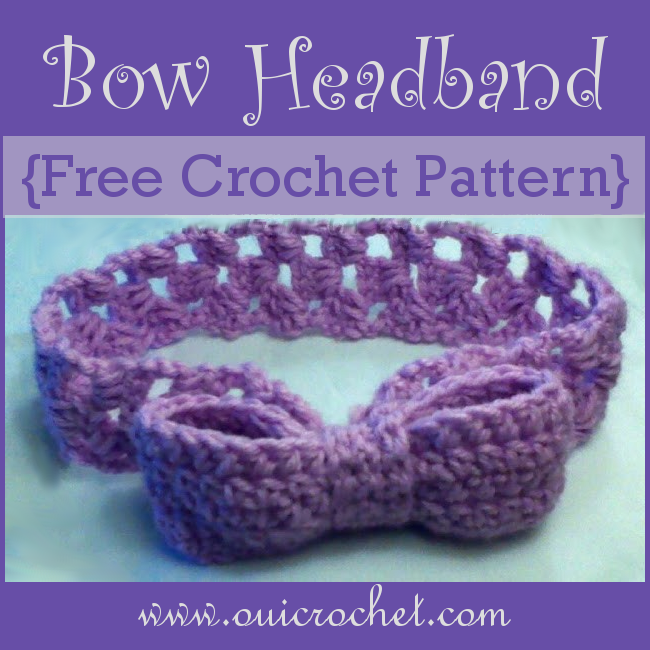 If not, you might want to find a little girl to crochet this adorable bow headband for! I mean, come on... what little girl wouldn't want it? It is fun and cute and the perfect accessory for any outfit. You can make one in every color! 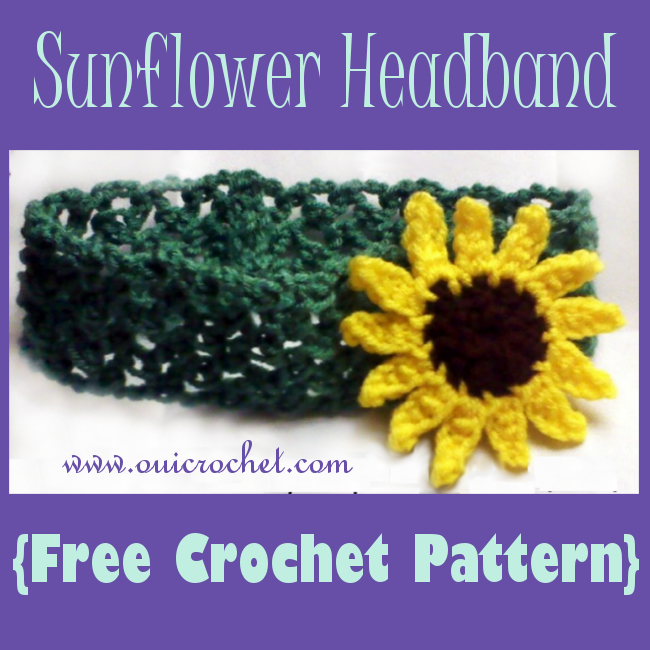 The headband is simple to make, just keep in mind, it has a lot of "give" to it, so you may want to experiment with going down one size. Check out my hat and headband size chart as a guide. Use the headband to make this bow headband, or use it to attach the applique of your choice. The same holds true for the bow. 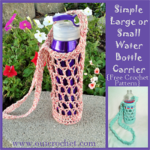 It makes a cute addition to a crochet dress or purse. Be creative, be colorful, and have fun with it! With size F hook, ch 5. Row 1: 2 dc in the 3rd ch from hook, ch 1, skip 1 ch, 3 dc in the last ch. Turn. Row 2: Ch 4 (counts as dc+ch 1), 3 dc in ch 1 space, ch1, dc in the top of the ch 3 from the previous row. Turn. Row 3: Ch 3, 2 dc in the first ch 1 space, ch 1, 3 dc in the last ch 1 space. Turn. Remaining Rows: Repeat rows 2 and 3 until you get the desired length. 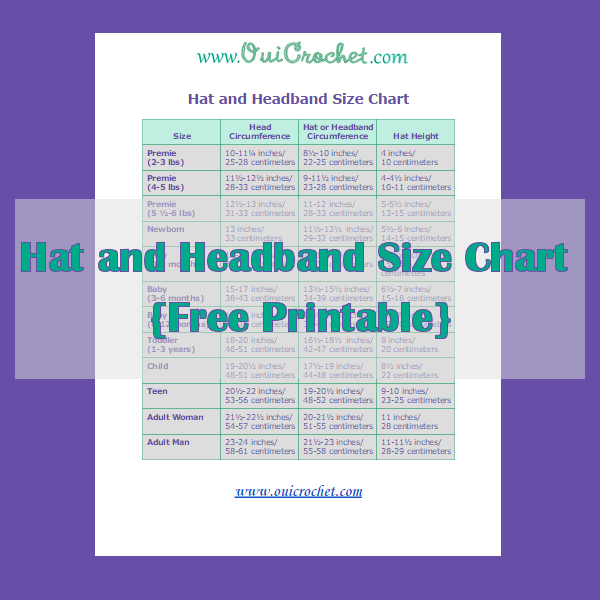 You can use this hat and headband size chart to determine your headband size. Sew short ends together to form a loop. Weave in all ends. With size H hook, ch 35. Row 1: Hdc in 3rd ch from hook and in each across. Turn. Rows 2-5: Ch 2, hdc in each across. Turn. Finish off. Fold bow in half and sew the short ends together. Rows 2-3: Ch 2, hdc in each across. Turn. Finish off. Fold in half over the center of the bow and sew the short ends together. Attach the bow to the headband. Weave in all ends. 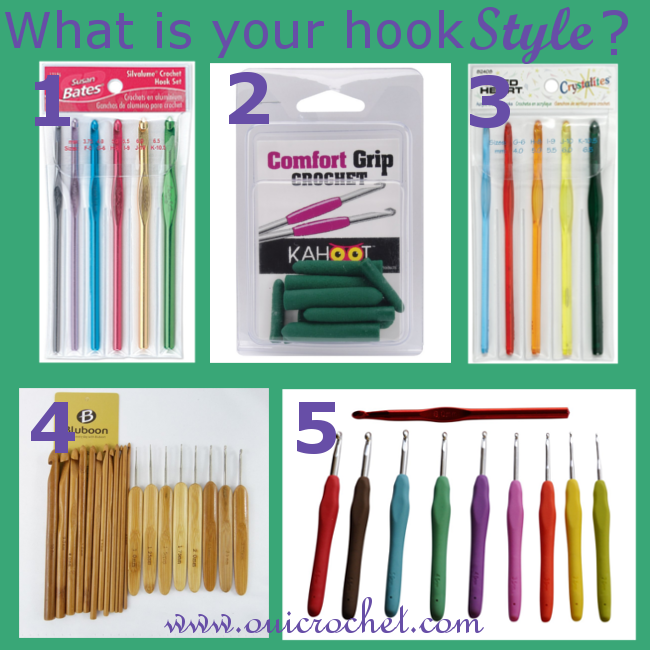 We all know that finding a nice comfortable grip is important when we crochet, but how much have you thought about the style of the hook you use? Whether you grip your hook over-handed (as if you are cutting with a knife) or under-handed (as if you are writing with a pencil), finding just the right hook style can optimize your crocheting comfort. 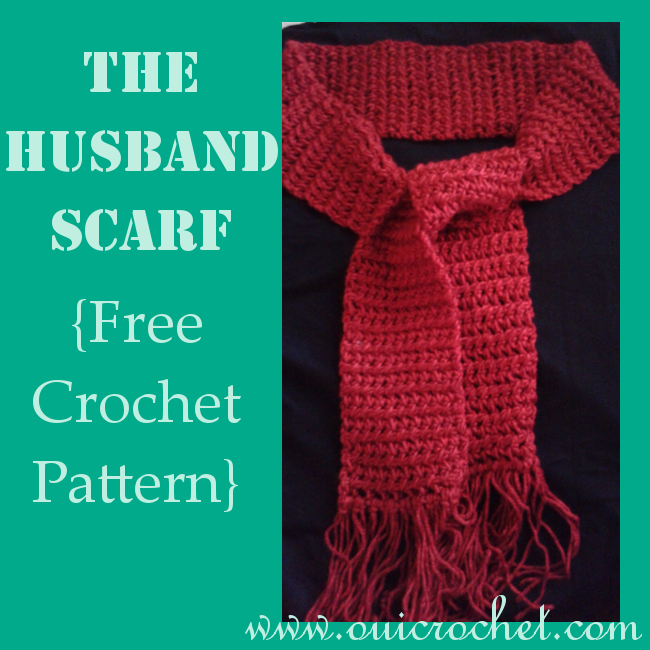 The right hook style can lessen or prevent hand fatigue when crocheting. If you have arthritis or carpel tunnel syndrome, a good hook style can allow you to crochet longer and more comfortably. Today, I am going to highlight four different types of crochet hooks, as well as a set of comfort grips. Each one has a slightly different feel. I encourage you to try out different styles, if possible, to find the one that benefits you most. 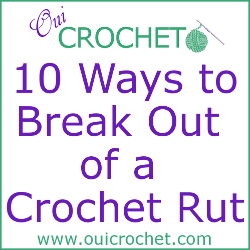 Do you have friends who crochet? Perhaps you can exchange hooks, so that you can try them out before buying. Alternatively, when buying a new style of hook, make sure you are comfortable with the store's return policy. If it doesn't work for you, you may be able to return it. 1. Susan Bates Silvalume Crochet Hook Set in Pouch Sizes F, G, H, I, J, K - These are simple, standard crochet hooks. They are made out of lightweight aluminum. Their in line head helps reduce wrist motion for fatigue free crocheting, while maintaining a consistent gauge. 2. Comfort Grip Crochet Hook 10/Pkg - Assorted Colors (one color per package) - These comfort grips fit on your standard crochet hooks. The grips reduce hand stress and prevent slipping. 3. Susan Bates Red Heart Crystallites Acrylic Crochet Hook Set, Size G/H/I/J/K - These simple crochet hooks are made of plastic, so they are perfect if you will be crocheting on a plane trip. They are lightweight and some crocheters experience less slipping with them. Like the aluminum ones, previously mentioned, the in line head helps to reduce wrist motion to cut down on fatigue. I understand that the smaller sized plastic hooks (G and smaller) tend to have some give to them, making it difficult to keep tight stitches. I would recommend these hooks for the larger sizes. 4. BLUBOON(TM) 20 Sizes Carbonized Bamboo Crochet Hooks -These hooks are made of aged bamboo. They are "green" hooks, which are produced without the use of chemicals. Their natural grip, and a slightly tapered head makes for ease of flow in your work. 5. Crochet Hooks & Needle Case Organizer | Premium Quality 11 pcs Ergonomic Hooks Soft Grip Crochet Kit - These are high quality soft grip ergonomic crochet hooks. The smooth, light feel makes them extremely comfortable for someone who likes to crochet for hours. 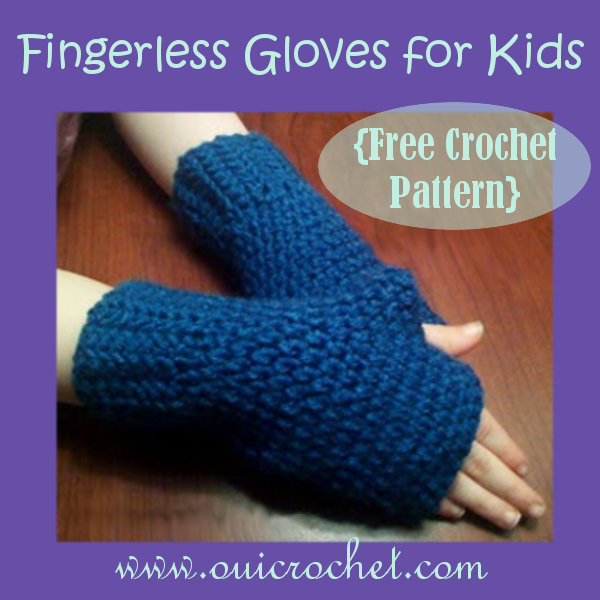 The ergonomic grip helps lessen the pain for arthritis sufferers who enjoy crocheting for long periods of time. These hooks are highly rated, and have a satisfaction guarantee. The kit even comes with a super cute hook case! These little slouchy hats are fun and cute. I think the brim makes them special. They look great in a variety of colors and color combinations. 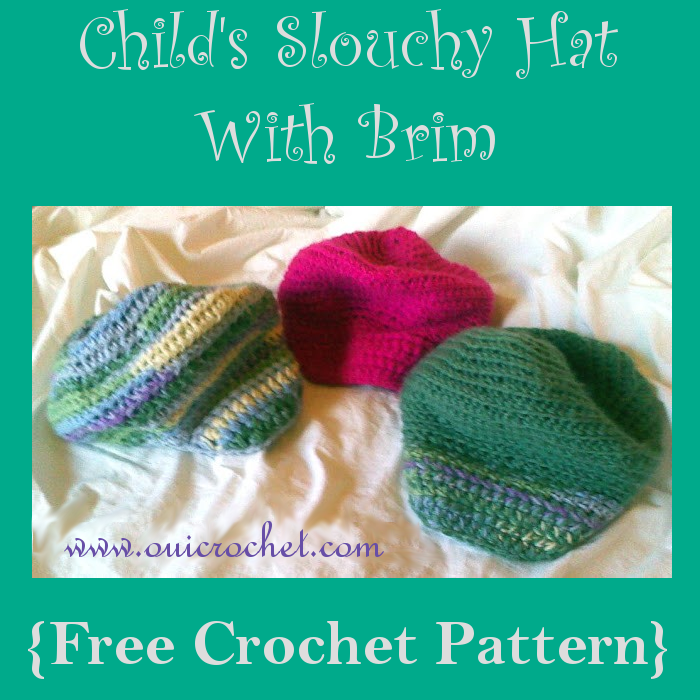 The slouchy hats are extra fun when they sport a complimenting color for the brim. You can further customize your slouchy hat by adding a cute crochet flower or applique. This hat is perfect for an intermediate crocheter. If you are a beginner, I think you could pull it off without any problems, if you have done a couple of hats already, and you are familiar with the stitches in the special instructions, below. Hey, give it a shot! That's how we advance, right? How to hdc 2 tog: yo, insert hook into st, yo and pull through, yo, insert hook into next st, yo and pull through, yo and pull through all 5 loops on hook. Mark sts: mark the first stitch of each round. It makes things much easier... trust me! * Replace the first hdc in each round with ch2. *When you join at the end of the round, you will sl st into the second ch of the ch 2 in the previous round. ch 4. Form a ring with a sl st to the first ch. Now, work through BOTH loops. Work with two strands of yarn together. Count 14 sts from the finished end of the hat, and join yarn in the 14th st. Round 1: ch 2, working FLO, hdc in next 21 sts. Turn. Now work through BOTH loops. Round 2: ch 2, hdc 2 tog, hdc in next 17 sts, hdc 2 tog. Turn. Round 3: ch 2, hdc 2 tog, hdc in next 15 sts, hdc 2 tog. Turn. Round 4: ch 2, hdc 2 tog, hdc in next 13 sts, hdc 2 tog. Turn. Round 5: ch 2, hdc 2 tog, hdc in next 11 sts, hdc 2 tog. Do not turn. 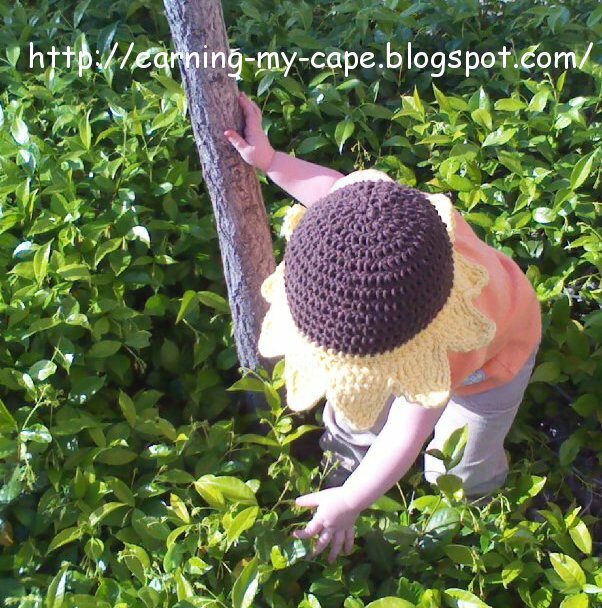 Trim: Work LOOSELY so that there is a little "give" to the hat. Now sl st around the entire hat and brim. Finish off and weave in ends. Who doesn't want warm hands when it's cold outside? The problem is, bulky gloves make it difficult to swing on bars, climb ladders and rock walls and play ball at the park or in the playground. 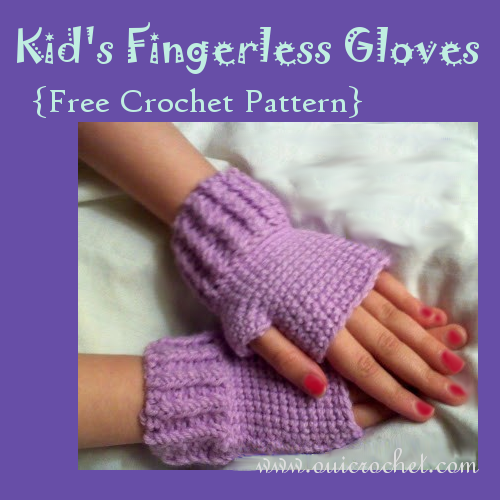 These fingerless gloves are great for keeping your kids' hands warm while they play! Do your kids use the tablet while in the car? These are great for that, as well. I mean, come on... you and I both know that it is pretty frustrating trying to use a tablet or a smart phone while wearing traditional gloves. These gloves don't take too much yarn and they are pretty quick to work up. If you prefer longer gloves, you can easily increase the rounds. 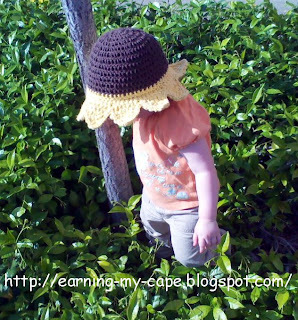 You can dress them up by adding a cute flower or applique, too. Using size F hook, Ch 27, join with sl st to first ch to make a loop. Round 16-20: Repeat row 15. Finish off and weave in ends. 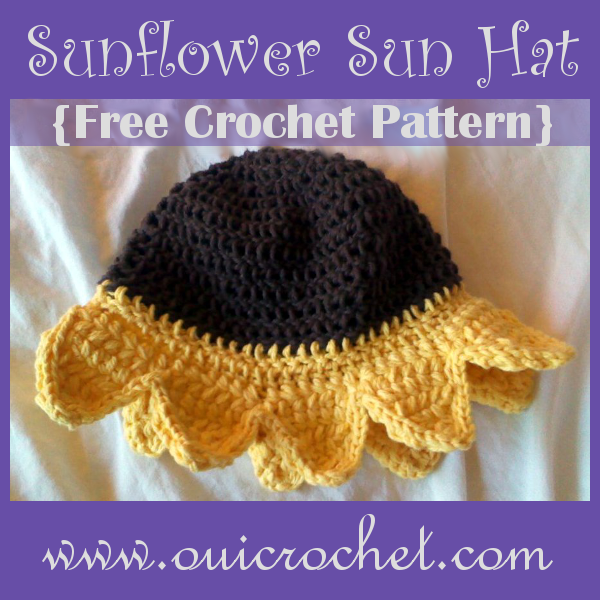 This sunflower sun hat is one of my most favorite little hats ever! It was a challenge for me to come up with and write the pattern, but I think it was well worth it. Despite my difficult beginnings, this hat is fairly easy to work up. The petal brim is fun to make. This hat is a child's size. You will notice that in my photos below, my (then) toddler is wearing the hat. I tend to crochet a bit tightly, so it was perfect for her. 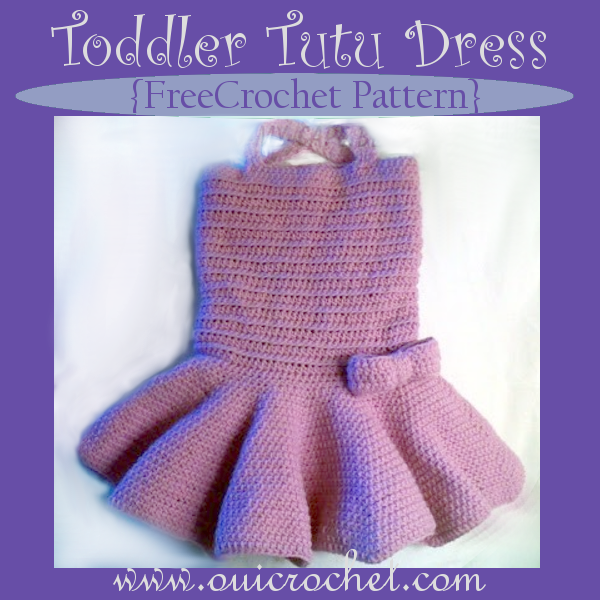 If you would like to make this in a smaller size, I would suggest going down a hook size, or two. Keep in mind that this pattern calls for cotton yarn. Cotton yarn has less stretch than acrylic. If you choose to make this hat with acrylic, again, adjust your hook size. The first ch 3 in each round counts as a dc. When joining at the end of the round, you will slip stitch into the top of the beginning ch 3. Using the brown, Ch 3, join with sl st to the first ch to form a ring. Switch to the yellow yarn. Reattach the yellow to the vertical strand of the first dc (this is the ch3) in round 14. Repeat 1-7 around. You should get 10 petals. Now sl st around entire petal brim. Do you like making hats and headbands? I know I do! I also know how frustrating it can be to wind up making the wrong sized hat. If you are "winging it" or trying to re-size a pattern to the size you want, it will be helpful to know what the measurement of your finished product should be. You start by knowing the approximate head size of your intended recipient. Can't measure your neighbor's cousin's granddaughter's head because she lives across the country? No worries, as long as you know about how old she is. This hat and headband size chart shows the approximate measurements for different ages, as well. Keep in mind that yarn is stretchy. Typically, a hat or headband is made slightly smaller than the circumference (measurement around) of one's head.